Jamaica, 1862 (Oct. 20) Port Royal, Jamaica to London, England, docketed "20th Octr." 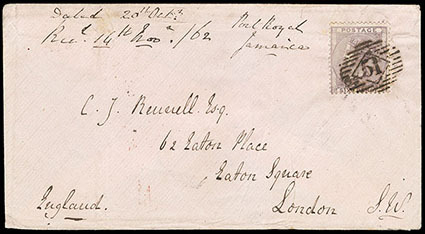 and "Port Royal, Jamaica" on light lavender cover bearing Great Britain, 6d lilac tied y "51" barred oval, red London (11.14.62) arrival backstamp, Very Fine. 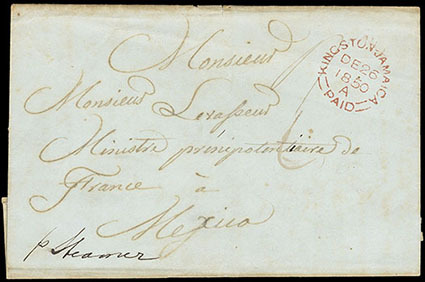 Jamaica, "Kingston-Jamaica, Paid, DE26, 1850", red cds on blue cover to Mexico, endorsed "p Steamer" at bottom left; minor edge toning, F.-V.F. Jamaica, 1872, Queen Victoria, 4d brown orange, tied by "A01" barred oval, matching partial "Kingston, Jamaica, JY 24, 74" backstamp on cove to Jacmel, Haiti, red crayon "4" pence credit rating, Very Fine. Scott No. 10. SG No. 11 Estimate $300 - 400. 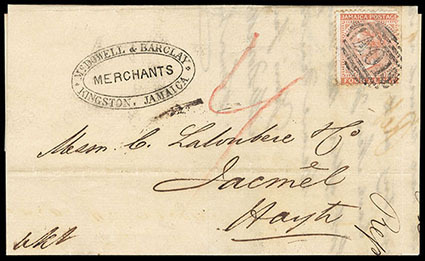 Jamaica, 1873, Queen Victoria, 1s dull brown, used with 1d blue (8) and 6d mauve (12), all tied by "A01" barred ovals, partial "Kingston, Jamaica, Oc 10, 74" cds backstamp on gray folded letter to Jacmel, Haiti, red crayon "2/-" credit rating and endorsed "p. Str. 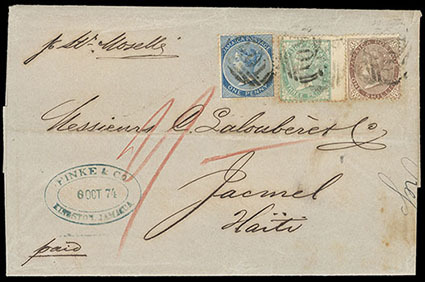 Moselle" at top left, zed: $725, Very Fine and scarce franking. Scott No. 12. SG No. 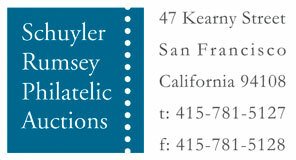 13 Estimate $750 - 1,000. Jamaica, 1877 Penitentiary Postal Cards, collection of 40 mostly mint cards on pages; includes first issues and a nice showing of the 2nd type border cards including bluish card, a very scarce group (no photo). 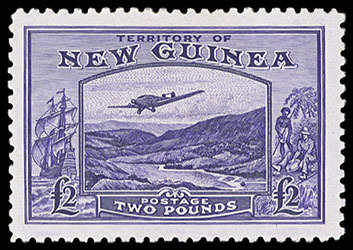 New Guinea, Airmail, 1935, Bulolo Goldfields, £2 bright violet, o.g., lightly hinged, fresh & Very Fine. SG No. 204. 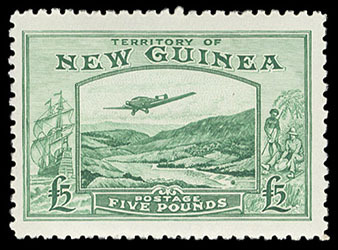 New Guinea, Airmail, 1935, Bulolo Goldfields, £5 emerald green, o.g., never hinged, fresh & F.-V.F., a scarce never hinged stamp. SG No. 205. Scott No. C45 $750 for hinged.